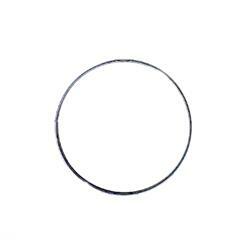 No, this is not the most complicated Venn diagram ever devised. This is, in fact, a collection of silver colored steel frames in various shapes, which you can use to frame your stained glass piece. Your creation will not only have a smooth outer edge, but also will have much more stability and rigidity. 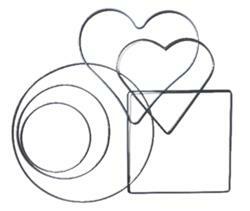 These frames are all 8 gauge wire, with the exception of the small heart, which is 7 gauge. The difference is not easily discernable; they all look the same. The large heart and large square are not as shiny as the others. This is a bright silver colored, 6-inch circluar steel frame, which you can use to frame your stained glass piece. Your creation will not only have a smooth outer edge, but also will have much more stability and rigidity. Made of 8 gauge wire (about 1/8" thick). This is a bright silver colored, 7-7/8-inch circluar steel frame, which you can use to frame your stained glass piece. Your creation will not only have a smooth outer edge, but also will have much more stability and rigidity. Made of 8 gauge wire (about 1/8" thick). This is a bright silver colored, 14-inch circluar steel frame, which you can use to frame your stained glass piece. Your creation will not only have a smooth outer edge, but also will have much more stability and rigidity. Made of 8 gauge wire (about 1/8" thick). 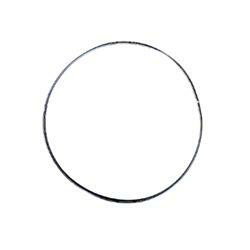 Metal Oval Frame - 6 in. x 11 in. 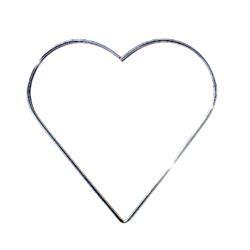 This is a bright silver colored, heart-shaped steel frame, which you can use to frame your stained glass piece. It is made of 7 gauge (1/8" thick) wire. The heart is 7-3/4" at its widest point across and 7-3/4" (197mm) high. Your creation will not only have a smooth outer edge, but also will have much more stability and rigidity. 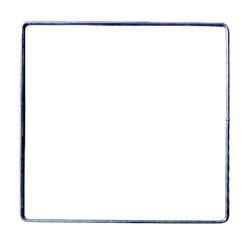 This is a silver colored, 8-1/2" (216mm) square steel frame, which you can use to frame your stained glass piece. Your creation will not only have a smooth outer edge, but also will have much more stability and rigidity. Made of 8 gauge wire (about 1/8" thick).